Good story with equally good values. An archaeologist returns home in triumph, bringing with him a precious jeweled peacock crown. As it turns out, though, he's also brought a curse with him. With deadly snakes on the move, Sherlock Holmes and his Baker Street Brigade need to work quickly before anyone else falls prey to the fabled curse. The Brigaders care very deeply for each other. Holmes is also quite attached to them, doing everything he can to help them. Two men apparently have an argument over what "crossing the line" for an action is. Danny instinctively puts his life on the line to save another. Holmes does not turn in a man for his petty crimes since he finds him to be a valuable informant. The Brigade members are Christians. A memorial service is held in a church and a couple hymns are sung. Someone wishes another Godspeed and prays that the Lord will guide his research. A few people pray for an ailing friend. The man that runs the shelter the boys live in holds chapel every morning; part of one is recorded. The crown supposedly has a "spirit guardian" and a curse attached to it. Someone remarks that he's surprised that the devil didn't show up along with the curse. Snakes are responsible for a few deaths and a near-death. A chair smashes through a window and lands on a police cab (no damage done except to the window). A caravan is attacked and a short exchange of fire ensues, ending in a single survivor. Duff loses consciousness; later, he is hit for no apparent reason. Peachy is yanked down and threatened with a knife. Danny is knocked out. The boys and Holmes fight a couple thugs. Peachy falls through a false ceiling. Holmes tests possible antidotes on mice. Holmes and two men fight and a gun goes off a few times harmlessly. The Peacock's curse involves snakes entering a person's eye sockets and devouring his brain. A group known as the Guardians of the Peacock take a drug before they attack. These, Holmes, and the boys' employer smoke. Holmes and the Brigade enter a pub in search for clues. Nothing of consequence. The boy's employer mentions a sultan's harem of "four-and-twenty wives". Danny and Peachy are sweet on the same girl and compete for her affection. Danny walks with her hand-in-hand once. She holds his hand and tells him how she feels about him when he's delirious. "Cor", "cripes", and "crikey" are common expressions, though the book does not indicate that these are euphemisms for Christ and God. "Blimey" is said too (apparently short for "God blind me", though the book gives no such definition). This is a good mystery that also reminds readers that a lot of mysterious happenings such as those in the book can be traced to human actions. Also important is the mention of Jesus being the Antidote for sin's poison. 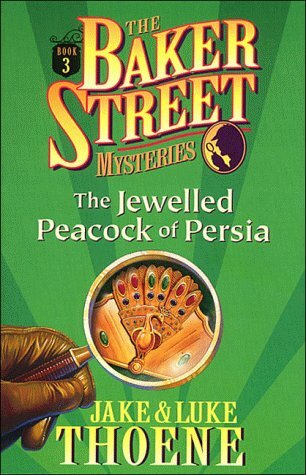 Note: The portrayal of Sherlock Holmes in this for-kids story is not necessarily accurate to the originals by Arthur Conan Doyle.